In October of 1985, CCS Inc., opened its doors as a company with Don Spence and Randy Cino as partners in the business. The business was an instant success with dozens of customers following us in our new venture. We bought replacement tubes Carrier, Trane, York, Wolverine and RPC. Our continued quality and word of mouth advertising grew throughout the western states. We brought on a few more technicians and began to build a good stock of replacement tubes. The 1500 square foot building we rented in Buena Park, California became too small to fast, so we moved into a 3000', then 5000', then 11,000 square feet in Chino, California, where we stayed for 10 years. During this time we bought out the retubing equipment from several A/C contractors who no longer wanted to do our type of work. We also bought the assets of Turbex Heat Transfer and the tube manufacturing equipment in 2000. We spent over $150,000 in a three year period completely rebuilding all three machines with new motors, controls, bearings, blocks and dies. Our Fin tube company is called “CAL-FIN” and produces very high quality finned heat exchanger tubing in copper, copper-nickel, stainless steel, carbon steel, brass and Titanium alloys. In 2002 we moved into a 20,000 square foot building for ten years also located in Chino, California. We applied for and received our ASME “U” and “R” stamp certifications for pressure vessel manufacturing and repair in May of 2003. We negotiated the asset purchase of Thermal Fin tube processors in Los Angeles, CA in August of 2003. We consolidated their shop into ours and now have a complete machine shop for drilling tube sheets, machining support plates, heads and bending heat exchanger tubes for u-tube bundles. 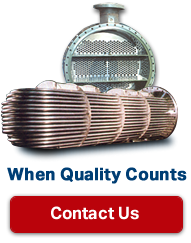 We manufacture and or retube all types of heat exchangers for customers all over the U.S.A. as well as Mexico. We also repair/retube and perform testing for the Naval, Marine and Cruise Ship Industry. Our excellent reputation has earned us nationwide recognition for quality testing, retubing, specialized equipment manufacturing and epoxy coating services. We perform this work in numerous cities throughout the U.S.A. for hundreds of Contractors, Building Management Companies, Universities, Hospitals and O.E.M. manufacturers. Our excellent reputation has also helped us obtain specialized work in Canada, Brazil, Hong Kong, Mexico, Taiwan, Japan, Vietnam, Venezuela, Tahiti, the Dominican Republic and Bahamas. Besides being a complete heat exchanger service facility, we are also a stocking distributor and repair facility for Goodway tube cleaning systems. According to Goodway Inc., We sell more Goodway Porta-Ram tube cleaning machines, than all of the U.S. sales centers combined. We are also a stocking distributor and service contractor for Airetool, Elliott, EGI and T.C. Wilson heat exchanger retubing and cleaning tools. We are a stocking distributor for Rydlyme® chemical cleaning products, and we provide the complete cleaning-pumping service to flush out and de-scale all type of heat exchangers, condensers, chillers, evaporators, and lube oil coolers. We are now licensed in CA, NV, WA, WI, and VA. We are continuing to grow and provide total heat exchanger and condenser/evaporator inspection, repair and coating services to a wide variety of industries. In 2012, we moved into our new business location at 13382 Benson Ave., Chino, CA 91710. We are now in a 40,000 square foot building with two indoor cranes, 3 acres of yard space for equipment and large heat exchanger services. We anticipate this to be our last move for a long time, as we have plenty of room to grow.